Grace "Maude" (Swearingen) Mansfield was born on Jan. 13, 1885 near Concordia, Cloud County, KS, the daughter of Thomas J. and Laura Catherine "Kate" (Johnson) Swearingen. She was a "lifetime resident" of Cloud County. On Oct. 26, 1904, at the age of 19, Maude married 22-year-old Sidney Linton Mansfield (1882-1964), at the home of her parents in Center Township. Sidney was a native of near Troy, Doniphan County, KS, and the son of William Simpson and Maria (Neeland) Mansfield. He and his parents had moved to Concordia from Doniphan County, KS when he was the age of three. The Mansfields had seven children, five of whom lived to adulthood -- Hazel Leota Johnson, Robert "Lloyd" Mansfield, Austin Dale Mansfield, Billie Elden "Bill" Mansfield Sr. and Melvin Ferril Mansfield. Sadly, Grace lost twin sons in a stillbirth on Dec. 3, 1916. Their tender remains were placed in the Mansfield burial plot at Pleasant Hill Cemetery. Their grave marker, seen here, was very clean and legible when photographed in September 2010 by the founder of this website. Maude and Sidney were longtime farmers of near Concordia. When the federal census was taken in 1920, the Mansfields made their home in the Condordia area. Among their neighbors were Maude's parents, brother Arley Z. Swearingen and their unmarried aunt Lillian "Mana" Johnson. They are seen here on the porch of their farmhouse south of Concordia, at an unknown date. Also seated with them are son Austin and his second wife Rhea. The census of 1930 shows the Mansfields residing in Cloud County, in near proximity to Maude's parents. Sidney was listed as working as a "general farm" farmer. Daughter Hazel, age 25, was employed as a public school teacher, and son Robert, age 21, also as a farm laborer. As Maude's mother Kate aged, she came to live with the family. She became seriously ill in the spring of 1955, and passed away in their home at age 93, in July 1955. 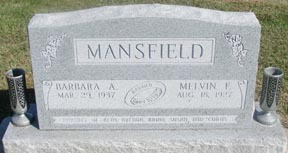 The Mansfields were married for slightly more than 60 years. They celebrated their milestone anniversary on Oct. 26, 1964. Sadly, just two months after their wedding anniversary, Sidney died of heart trouble at age 82, on Dec. 20, 1964, at St. Joseph's Hospital. Funeral services were held at the Chaput Funeral Home in charge of Rev. H.H. Vogel, pastor of the Evangelical United Brethren Church. Pallbearers included Jim Rittel, Keith Macy, Travis Swenson, Ralph Stolzenburg, Levi Deneault and John Laman. He was placed at eternal rest in the Pleasant Hill Cemetery. He was survived by nine grandchildren and four great-grandchildren. Maude passed away at the age of 80 on Jan. 2, 1966, in St. Joseph's Hospital in Concordia. Her obituary in the Blade Empire said she "had been in ill health for six months but seriously ill a week." She is buried beside her husband in Pleasant Hill Cemetery, near their infant twins. At the time of Maude's death, she had nine grandchildren and four great-grandchildren. 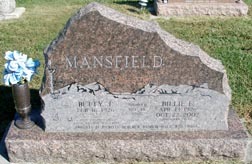 Daughter Hazel Loetta Mansfield (1905-1994) was born on Feb. 25, 1905 in Concordia. On June 17, 1930, at the age of 25, Hazel married 24-year-old William Harrison "Bill" Johnson (1906-1996), in Concordia. He was the son of William and Gretchen (Kuehne) Johnson of Yuma, CO.
Bill is not known to be related to Hazel's family of Johnsons. The couple bore one daughter, Eloise Larson. 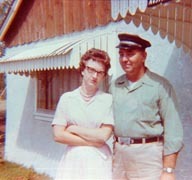 Hazel and Bill resided for many decades in the Concordia area. She was a graduate of Colorado College and "taught grade school at Huscher and other grade schools for 17 years," said a Concordia newspaper. "She also worked at the courthouse in Concordia for a few years." They were longtime members of Trinity United Methodist Church in Concordia. Bill "worked as a carpenter for 30 years and did some farming as well," reported a newspaper. He was a member of St. Johns Lodge #113 AF and AM of Concordia. Hazel, second frim left, at a Mansfield gathering, early 1960s. L-R: Lloyd, Hazel, parents Grace and Sidney, Melvin and Austin. The Johnsons resided in Cloud County until they grew infirm and were unable to care for themselves. They moved to the Republic County Hospital Long Term Care Facility in Belleville. Hazel died there first, at the age of 88, on Feb. 24, 1994. Bill outlived her by more than two years. He passed away at age 89 on Aug. 13, 1996. He was survived by one grandchild and two great-grandchildren, as well as siblings Thelma Pletcher, Anna Mae Arnold and Franklin Johnson. A red granite stone marks their final resting place at Pleasant Hill Cemetery in Concordia. Daughter Eloise Elaine Johnson (1933- ? ) was born in 1933 in Concordia. On Oct. 18, 1952, she was united in wedlock with Verl S. Larson (Oct. 1, 1928- ? ), a native of Jamestown, Cloud County. Their only known daughter is Jean Ann Jarmello. Granddaughter Jean Ann Johnson was born in Belleville, KS. She married Robert Jarmello. Son Robert "Lloyd" Mansfield (1908-1997) was born on July 18, 1908 at Concordia. He attended eight years of elementary school at Pleasant Hill District Twelve in Cloud County. Lloyd grew up in this rural area south of Concordia,... working with his father as a farmer. He also worked for many years at the local livestock sale barns. He always volunteered to help his neighbors. Lloyd was significantly older than several of his brothers, and never married. He passed away at his home near Concordia at the age of 89 on July 26, 1997, just nine days after the demise of his brother Dale. Diabetes contributed to both of their deaths. Following funeral services held at the Chaput-Buoy Funeral Chapel in Concordia, led by Rev. Dean R. Frazier, he was buried in Pleasant Hill Cemetery. 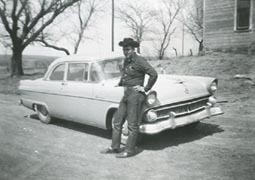 Son Austin "Dale" Mansfield (1921-1997) was born on Jan. 29, 1921 in Cloud County, KS. During the 1930s, he worked for the Works Progress Administration, a federal government program to keep Americans employed on public works projects. He also labored for the Civilian Conservation Corps and planted many trees in the Concordia area. Said a local newspaper, he "was a truck driver in Concordia before moving to Liberal in 1957... He worked as a gasoline transport driver for Bridge Brothers, maintenance with the State Department and as a contract mail carrier for the U.S. Postal Service, retiring in 1985 and moving to Colorado." He was married twice, first in 1941 to Darkis Graham ( ? - ? ). The couple produced one daughter, Eilene Jean Henderson. They later divorced. On June 25, 1958, in Perryton, Ochiltree County, TX, Dale married his second wife, Rhea Lea Ninemire (March 10, 1928-2018), daughter of James Vernon and Helen Marie (Way) Ninemire of Talmo, KS. Rhea brought a son to the marriage, James Richard. Mansfield. The couple adopted one daughter of their own, Ila Marie Hittle. Rhea grew up in the "Old Johnson Place" -- made of rock - north of Concordia, and she attended grade school in Minersville. Later, in March 1942, her parents relocated the family to the "Boden Place" where she graduated in 1946 from Miltonvale High School. She earned a living working in the Concordia Hospital laboratory and at Country Kitchen. The Mansfields lived in Concordia before making a home in Liberal, KS until retirement in 1985. From there they moved to Colorado. Suffering from diabetes, Dale underwent surgery to amputate his right leg below the knee in March 1995 and then again in April 1996 to remove the big toe on his other foot. Austin "Dale" and wife Darkis, 1950s. Right: Dale in the front yard of his parents' farm south of Concordia, 1958. At the age of 76, on July 17, 1997, Dale died in Hotchkiss, CO following an extended illness of diabetes. His remains were returned to Kansas to be laid to rest in the Pleasant Hill Cemetery in Concordia. At the time, he was survived by eight grandchildren and 21 great-grandchildren. Rhea survived her husband by 21 years. She was employed as a bookkeeper for Southwest Gas & Equipment Company and later worked for certified public accountant Jim Haddock, CPA. She eventually changed jobs and moved to National Carriers in the proration department. At the age of 90, she passed away on Sept. 6, 2018. Her cremains were placed into rest at Pleasant Hill Cemetery. In an obituary, the family asked that any memorial donations be made to the Kansas Sugar Diabetes Association, Dementia Foundation, Alzheimer Foundation or Kansas Heart Foundation. Daughter Eilene Jean Mansfield (1941- ? ) was born in 1941 in Concordia. When she was 19 years of age, on Aug. 20, 1960, she wedded Donald Henderson ( ? - ? ). The Hendersons were the parents of Donald Lee Henderson, Max Eugene Henderson and Tammy Jean Henderson. They resided in Belleville, Republic County, KS in 1997. Son James Richard Mansfield was born in Sept. 1947 in Clay Center, KS. He has been married at least four times over the years. His first wife was Rose. They divorced in Hawaii. His second spouse was Sheryl. They divorced in Liberal. He and his third bride, Sheri, divorced in Liberal. In about 1979, he wedded his fourth wife, Anne Marie Palmer in Liberty. They bore a daughter, Jaymie Leanne Mansfield. The fourth marriage appears to have ended within a year, and Anne Marie married David Galbreath. He made his home in Georgia in 1997. Granddaughter Jaymie Leanne Mansfield was born in Liberal. She was adopted by her stepfather, David Galbreath. Daughter Ila Marie Mansfield was born in 1950 in Clay Center, KS and was adopted by Austin Dale Mansfield in 1968 at her request. On June 1, 1968, at the age of 18, she married her first husband, Jimmy Lee Walton ( ? - ? ). The couple produced a son, James Dalee Walton. On May 21, 1971, in a ceremony held in Hugoton, KS by the hand of Rev. Sumner Morrison, she married Danny Hittle ( ? - ? ). He brought two offspring to the marriage, Lisa Michelle Hittle and Christopher Sean Hittle. They have resided in Iuka, KS. Ila has been a significant contributor to the Johnson pages of this website. Grandson James Dalee Walton was born in Liberal. Step-granddaughter Lisa Michelle Hittle was born in Liberal. Step-grandson Christopher Sean Hittle was born in Liberal. He married Aymee Elizabeth Keith in 1990 in Hugoton, KS. Son Billie Eldon "Bill" Mansfield Sr. (1926-2002) was born on April 13, 1926. He married Betty J. Graham (Feb. 16, 1926- ? ) on Oct. 18, 1946, when both were age 20. The wedding took place in Goodland, Sherman County, KS. They had five children -- Phyllis Ann Crawford, Beverly Kathleen Pierce, Ronald Duane Mansfield, Billie Eldon Mansfield Jr. and Laura Louise Reiss. Said a newspaper, "He lived in Glendale, Ariz., before moving to Crawford, Colo., in 1971. He served in the U.S. Marine Corps." He also was a real estate surveyor for the federal government. Said a newspaper, he "enjoyed raising chinchillas, fixing things and traveling." Bill and Betty endured the deaths of two of their married daughters -- Phyllis Crawford and Beverly Pierce. The details are not yet known. Suffering from heart issues, at the age of 76, Bill died at Delta County memorial Hospital in Delta, CO. His remains were returned to Concordia for burial at Pleasant Hill Cemetery. At his death, he was survived by 12 grandchildren and 11 great-grandchildren. Daughter Phyllis Ann Mansfield (1947-1998) was born on June 5, 1947 in Concordia. On June 25, 1965, she married Carnley Mack Cranford ( ? - ? ). They were married and divorced twice. They were the parents of Brian Dale Cranford, Dawn Renee Cranford and Curtis Mack Cranford. The family lived in Liberal until moving to Memphis, TN in the late 1960s. Stricken with lung cancer after a life of cigarettes, Phyllis passed away in December 1998 in Memphis. Grandson Brian Dale Cranford was born in Liberal. Granddaughter Dawn Renee Cranford was born in Memphis. Grandson Curtis Mack Cranford was born in Memphis. Daughter Beverly Kathleen Mansfield (1949-1985) was born on April 3, 1949. Her first spouse was James Barr ( ? -1971). Their wedding took place in Buena Vista, CA on Oct. 26, 1966. Their only daughter was Wendy Lee Barr. Sadness blanketed the family when John died on Sept. 15, 1971. After five years as a widow, on New Year's Eve 1976, she wedded John Pierce (1948- ? ). They produced a daughter, Darla Monique Pierce. Tragically, Beverly ended her life with a shotgun blast in Denver in September 1985. Granddaughter Wendy Lee Barr was born in Denver. Granddaughter Darla Monique Pierce was born in Denver. Son Ronald Duane Mansfield (1950- ? ) was born in Aug. 1950 in Cncordia. He married Lydia Lynn Crane on May 26, 1971 in Salida, CO. Their one known daughter is Sabrina Ann Mansfield. They have made their home in Sneads, FL. Granddaughter Sabrina Ann Mansfield was born in Denver. Son Billie Eldon Mansfield Jr. (1954- ? ) was born five days before Christmas 1954. In Oct. 1978, when he was age 23, he married Melissa DeMass ( ? - ? ). The Mansfields lived in Crawford, KS. Their children are Daniel Mansfield, Tiffany Mansfield and Brandon Mansfield. Daughter Laura Louise Mansfield (1956- ? ) was born in March 1956 in Phillipsburg, KS. On Sept. 2, 1980, she was joined in matrimony with Lynn Thompson ( ? - ? ). Their four offspring were Josh Thompson, Kathy Thompson, Lucas Thompson and foster child ryan Thompson. The couple divorced on Sept. 2, 1980. Later, she wedded a second time to (?) Reiss and resided in Garden City, KS. Son Melvin Ferril Mansfield (1927- ? ) was born on Aug. 18, 1927 in Concordia. On Feb. 2, 1952, in nuptials held in Salina, KS, he married his first bride, Marjorie DeGraff (Nov. 3, 1933- ? ), a native of Concordia. They produced two children, Curtis Lee Mansfield and Susan Ann Mansfield. Later, on May 31, 1980, he married Barbara A. (Crum) Sheridan (1937- ? ) when he was age 53, and she 43. Their children were Beth, Brenda and Brian. Son Curtis Lee Mansfield (1963- ? ) was born in March 1963 in Concordia. On Jan. 16, 1964, in nuptials held in Concordia, he wedded his first wife, Krissy Peak ( ? - ? ). Their two children are Krissy Lea Mansfield and Nathan James Mansfield. Then on Oct. 18, 1994, he married a second time to Tammy Smith in a ceremony held in Summerfield, KS. Daughter Susan Ann Mansfield (1958- ? ) was born in Sept. 1958 in Concordia. When she was 27 years of age, on Aug. 30, 1986, she married Gary Alan Lindeen (1962- ? ) in a ceremony in Concordia. The couple moved to Spain and lived in the late 1980s in the town of Rota. Their two children were Brenda Dyan Lindeen and Karily Alaine Lindeen, both born in Spain. Granddaughter Brenda Dyan Lindeen was born in Rota, Spain. Granddaughter Karily Alaine Lindeen was born in Rota, Spain.